Monsoon Heidy Navy Ivory Stripe Linen Mix Mini Dress UK 14 EUR 42 US 10. Ladies Cotton Summer beach dress size medium uk 12 Gorgeous bright pink embroidery and tassels measurements when laid flat are:- Top of shoulder to hem is 31 inches pit to pit is 19 inches Dispatched with Royal Mail 2nd Class. NEW black kaftan/tunic dress with gold coloured embroidery, size XL. The length is 44" and the chest is 44". Next Beach Red Floral Embroidered Dress . Condition is Used. Worn on holiday I cut out the label as it was annoying me Dispatched with Royal Mail 2nd Class. Ladies Beach Dress Cover Up Size large ~ UK 16 measurements when laid flat are:- top of shoulder to hem is 31 inches pit to pit is 22 inches Lovely bright pink embroidery and tassels Condition is New with tags. Dispatched with Royal Mail 2nd Class. White Stuff ‘Desert’ beach sun dress. Size Medium. RRP £45.00 BNWT. White Stuff ‘Desert’ beach sun dress. Size Medium. RRP £45.00 BNWT. Condition is New with tags. Bought for a holiday but never worn. Still tagged and the protective tissue is even still in place over the tassels at the tie neck! Absolutely beautiful, but sadly the chartreuse embroidery doesn't suit my skin tone, but I really love it! Time to pass it on to someone it will suit! Dispatched with Royal Mail 2nd Class. Gorgeous Floral dress from La Redoute in size 16/18. Condition is Used. Very white. No stains. But it needs a couple of stitches at the top of the zip. No other signs of wear. Reflected in the low starting price. Pretty Beige Summer Beach Holiday Dress from F&F @ Tesco - Size 20 I believe as label has been removed. Please see photos for exact measurements and details. The dress is very loose as not fitted , it is ideal for hotter days or holidays.it is lined . From a smoke free and pet free home. Black beach dress with multi coloured embroidery on front and multi crocheted neckline. Adjustable straps. Elasticated top back. New with tags. Size medium. From George. Next White With Red Embroidered Dress. Condition is New with tags. Dispatched with Royal Mail 2nd Class. Great for holidays beach or summer time. Any questions please ask as I do not accept returns. H&M Crisp Cotton White Tunic/dress With Embroidered Detail Size 12 Worn Once. Perfect for summer holidays. I’ve only worn this item once as it was too big for me. I have however cut the care label out as it was very big. This item is machine washable. Dispatched with Royal Mail 2nd Class. Kaftan style dress/top purchased from a designer shop in cyprus. This is peach and cream in colour. The neck has a drawstring so can be worn slightly off the shoulder or tied. The dress is unsized but would say would fit 12/16 depending on how loose you wish to wear it. There is an embroidered flower design and also lace on the item. The sleeves are slightly flared at the bottom. From a smoke and pet free home. Please look at my other items having a massive clearout. Original Kaftan. Condition is Used. Bought in Greece a few years ago, worn once. Original price was £40. Beautiful kaftan with detail around the neck. Gorgeous colour and the sheer fabric is light and soft. No care or fabric labels but feels silk like. White Embroidered Beach Dress. Condition is Used. Dispatched with Royal Mail 1st Class. Ladies NEW Midi Beach Dress. Tie dye pattern to the tope and hemline. Pretty embroidered detailing to the front of the dress. 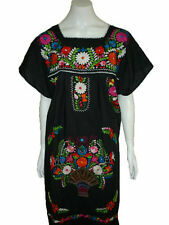 BNWT ANTHOLOGY Black embroidered light crinkle-cloth Tunic/Dress Size 18 beach holiday summer. Beautiful soft texture and embroidered bib front with tassle ties. Great to wear on holiday by the pool. Lovely and soft kaftan to look glamorous and covered up when you are chilling out after a swim. You could wear out with a belt to give more structure as a dress depending on how tall you are and how short you want the tunic dress to be. Condition is New with tags. Dispatched with Royal Mail 2nd Class. 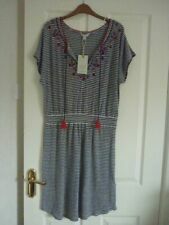 Monsoon 'Josette' Dress, size L, BNWT. Condition is New with tags. Dispatched with Royal Mail 1st Class. Kaftan/dress/top- Made With swarovski - One Size - Super Sparkly! Kaftan, summer dress or tunic top. Length: lining 30inch, outer 32inch Not see through with lining Made with genuine Swarovski crystals so super sparkly in the light/sun. Great casual or party used but like new Note I’m posting from Portugal so may take a littlest longer. I’ll provide tracking, price is shown via CTT (could only select Royal Mail as option) Any questions just ask.